Greece's parliament ratified Friday the protocol for North Macedonia's NATO membership alliance, signed in Brussels Wednesday by the representatives of 29 Alliance member states. 153 Greek lawmakers voted pro, thus opening the way for the Prespa Accords to come into full force. 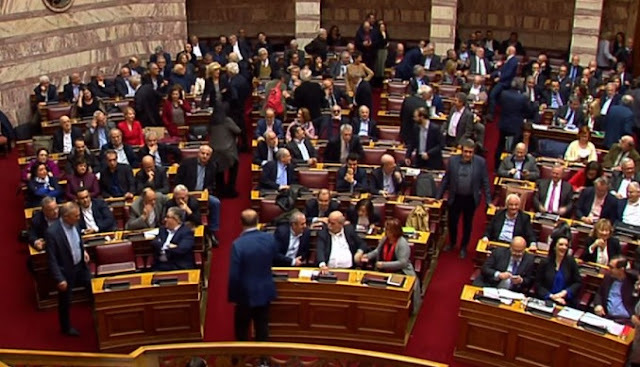 The debate in the Greek Parliament lasted for about 11 hours. The Greek Prime Minister Alexis Tsipras said that "the vote closes an important cycle, the most important of the commitments stipulated by the Prespa Historical Agreement." Meanwhile, the opposition leader Kiryumoto Micotakis stressed that for 140 years Greece had not allowed a third party to monopolize Macedonia's name and that he would never welcome the "Macedonian Prime Minister." In Skopje the Macedonian Prime Minister Zoran Zaev said on a Facebook post: "OUr friend country, Greece is the first state to ratify the Protocol for our country's NATO membership. We go to guaranteed success. It's easier with allies, we say with pride that we are in NATO." Now, Greece must officially announce the Republic of Macedonia (North) that has ratified the Protocol for its membership in NATO, and then there will be a written exchange of letters and the United Nations will be notified of the decision as well as all other international organizations that the new constitutional name of the Republic of Macedonia is "the Republic of North Macedonia" and that this name will be used from now on in the UN as well as from other organizations and all states.